The Dickinson College Farm is proud to provide grass-fed, humanely-raised meat for the campus community. We hope that our efforts to care for, respect and love these animals is reflected in the quality of our animal products. In recognition of our efforts to provide exemplary care for our livestock, all of our meat is certified Animal Welfare Approved. Farm customers are welcome to visit the livestock and ask the farm crew about how the animals are raised. 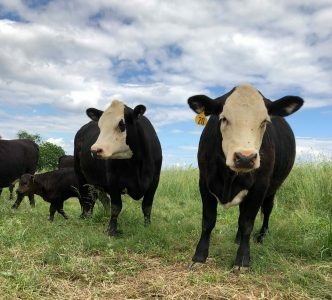 Learn more about our grass-fed livestock here. The Dickinson College Farm raises beef cattle and market lambs. We keep a rotating stock of frozen retail products, including a variety of steaks and roasts, ground beef, and sausages. All meat is priced by the pound, so each cut varies slightly in price. Please find estimated prices on the availability list below. The farm team will communicate your final price after you have placed your order. Please follow this link to access our order form. You will also find our most current product list, approximate prices, and instructions for pick-up in the order form. A real live member of the farm crew will respond to your order within one business day. We will pull and weigh your order, calculate your bill, and email back a confirmation. Meat orders will be packed and calculated Tuesdays and Fridays between 8:00 and 9:00 am. Please place your order by midnight on the day before you would like to pick up your meat. Pick-up is currently available on Tuesdays and Fridays from 8am-12pm or 1pm-5pm at the Dickinson College Farm. Please bring a cooler or bag to transport your grass-fed beef. Thank you for supporting local, grass-fed meat!